"Fisheries management has moved away for an early preoccupation with the fish to a greater concern about the livelihoods of the fishers and their families." Any resource can only be managed if sufficient good data and information are available. Unfortunately this principle has been generally overlooked in the case of inland fisheries where data are essentially weak and generally insufficient for taking the kinds of decisions that are needed. This lack has contributed to the generally poor state of inland fisheries resources around the world. There is, therefore, a general need to collect more and better data and information on the inland water environment, the fish and the fishers that form the essential components of a fishery. Collection of data and information is expensive in that it requires people, transport and communication systems to be effective. Furthermore it requires trained people that may not always be available. Because of the cost and the demands on often scarce trained personnel it is important that any programme for the collection of fishery information be efficient. It is also important not to collect more data than is needed for the management of the fishery. Especially in financially constrained circumstances the data and information collected should be tailored to the job on hand. This requires a clear definition of the objectives of management and knowledge of the functions and limitations of the different types of information. This paper identifies some of the types of information and data required for management at different levels of complexity and for different purposes. Conservation objectives, such as sustainability or biodiversity conservation. Most fisheries are managed for a mix of these objectives. It is, therefore, important to agree on a common approach to the fishery so that data collection systems serve the greatest number of interested parties. A distinction is made in this paper between data and information. Data are raw numerical values (statistics) that must be analysed to become information. Information may also be non-numerical and deal with such questions as whether it is the men or women who fish or whether a particular species migrates. In both cases the interpretation process is as important as the collection process. Data and information for various sources must be put together to form the basis for management. 1) Absolute, which attempts to assign values to such variables as catch that are as close to reality as possible. Absolute values are generally a snapshot of the situation at a point in time. 2) Relative, which attempt to trace the movement of values over time from a baseline. The baseline itself may be an absolute value or one that is selected arbitrarily in the time series. The fish, including data and information on feeding, breeding, growth and mortality as well as any migrations and other aspects of biology; The fishery, including statistics on landings and effort, information on gear and its performance, information on behaviour and income of the fishers and their families; The environment, including information on water quality and quantity and the degree of modification of aquatic habitats and ecosystems. 1) One-off studies and surveys that are expensive and detailed operations usually designed to establish absolute magnitude of a resource for valuation of a fishery, to obtain essential livelihoods information on the social and economic situation of fishers, to establish baseline information and to set up a sampling frame. A frame survey divides a river or lake into various strata or zones according to ecological, fishery or social characteristics, identifies sampling locations that are typical of the various strata, and lays down a schedule for the timing of sampling. Division of the area into strata makes it easier to group sampling sites and interpret the data collected from them. 2) Regular surveys are carried out at regular intervals to monitor changes following major studies. A sampling frame may be used to select the number and location of the sampling sites. Daily/weekly collection of data is used to establish local trends at individual markets and landings. A sampling frame may be used to specify landings and markets that are main data collection points. Research programmes that address particular issues or aspects of the fishery and its environment. Research is needed, for example, to define details of the biology and ecology of the living organisms involved in the fishery, the social and economic circumstances of the fishers and their families, market patterns and conservation needs. 3) Existing data and information should never be overlooked. With the exception of the very largest lakes and rivers, inland fisheries are replicated systems based on many similar small lakes, streams and reservoirs. As a result, there is an accumulation of data and information internationally that has been codified in series of textbooks, guidelines and indexes that can be transferred to a national fishery with relatively little effort. Within a country there is also much information on aspects of the fisheries in a particular basin that can contribute to establishing a historical baseline and measure of change. 1) Markets, which are the great concentration point of the fish sold and passing through the commercial network. They are particularly useful in diffuse fisheries where there are no defined landings. Because of the volume of fish passing through, and the fact that the product has often been treated by smoking, salting or drying, they can be relied upon only for coarse statistics on weight of the fish and maybe main species types. 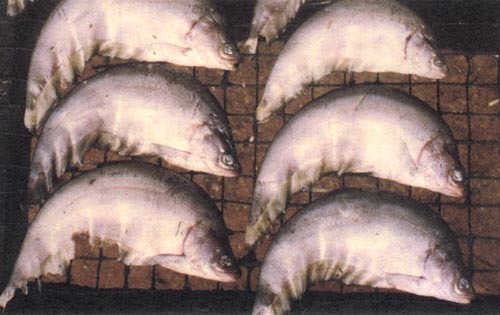 Market surveys carry the danger of double counting, as the same fish may appear more than once in the same market or in successive markets in the chain. 2) Landings, which are the primary collection point of fish landed. These are particularly valuable in lakes or large rivers where definite points have developed for landing and sale of fish. They collect data primarily on quantity of fish landed by the fishery and can also be used to gather data on species, weight, length and sexual condition. They are also good for the collection of data on the types of gear in use. Landing statistics are less applicable in some river fisheries where landing and sale are diffuse and the majority of the fish caught is not channelled directly to discrete localities. Landing data are also incomplete in that it misses the often considerable amount of fish consumed by the fishers, their families and associated communities (autoconsumption). 3) Fishing villages, through family and household surveys, which can detect sources of fish that are not dependent on landings and boats but which are collected from small water bodies by women and children. Such surveys are also useful for understanding how the fishery works. They can supply data on gear use patterns and on the social and economic organization of the fishers. Individual fishers, who are difficult to sample on a regular basis in most fisheries. They are however the best source of data on the performance of individual gear use and on the types and sizes of the fish caught. They can also be helpful in providing information about autoconsumption patterns and the allocation of work among participants in the fishery. 1) Indicators, which are criteria, species or processes that are identified as representing changes to the fishery. These can be values, changes in quality or quality, trends in relative values or a simple presence or absence of a condition or species. Indicators are usually related to reference points or values that signal critical changes in the fishery. Indicators should be chosen so they are relatively easy to sample and calculate from routinely collected data. Reference points are more difficult as they depend on the management model to be adopted or the policy regarding the fishery as a whole. 2) Variables, which are the components of indicators and are the actual material collected. Which variables are collected are determined by the particular management model used and by logistical considerations such as ease and cost of collection and the availability of trained people. 3) Indexes, which are combinations of variables into simple models that are based on information collected over a period of time and a wide geographic area. They serve primarily as a basis for comparison of the situation in a particular fishery with a wider standard. For example indexes such as the morpho-edaphic index or the river catch index can be used to determine approximate values of the catch to be expected from lakes and rivers and integrated biotic indexes (IBI) can be used to monitor the health of the fish stock. Accurate data is that which closely corresponds with the true situation of the fishery. However, data can be collected at differing levels of detail. For example catches can be calculated precisely to the second or third decimal point but such a degree of precision means very little because the fishery is constantly changing and such a level of detail has little influence on the decisions to be made. It is generally more important to be accurate and arrive at a more general figure of catch that actually influences policy. The type, amount and degree of detail of the data collected depends on the type of model used for management of the fishery and governmental policy on the degree of intervention in the management of the fishery. In resource poor situations it is better to adopt simpler models that require less data. It is better to collect less data that is accurate than to expend effort collecting large amounts of poor quality information in the hope that the extra detail adds more information. In general, however, the more complex the decision to be made the more information required to make the decision in an informed manner. For example, a decision regarding whether or not to establish a sampling site at a particular landing can be made simply on the basis of a general knowledge of catch in the area that can even be obtained from a simple index. Decisions regarding the number of individual catch quotas and licenses at the same landing could require detailed knowledge of the performance of the fishery and the social and economic circumstances of the fishers. Whatever the circumstance there should be a long-term commitment to collect at least the most basic catch statistics at representative landings. The following two models of fishery management illustrate the differences in data needed by different models. The maximum sustainable yield concept provides a reference point that predicts the level of effort at which the maximum amount of fish can be sustainably captured from a stock (Fig. 1). MSY tends to be an absolute value. There are two approaches to this model. The first is a simple approach based on an analysis of catch against effort and requires data on both these variables. This is, therefore, a relatively easy model to use and requires very little data. However, it can only be done on a single species basis and so the same two variables have to be collected for all species in the fishery. This means that it is a useful model for lakes where few species make up the majority of the catch. It is equally useful in river fisheries that concentrate on a few large species. It is less useful in true multi-species fisheries. The second method provides better estimates of MSY but can only be obtained through more complicated stock assessment procedures that require complete data on mortality, recruitment and growth for each species. Such complicated models allow for more detailed evaluation of management regimes, such as those based on size limits, but do not necessarily provide better estimates of MSY. These types of models are also known as surplus production models (SMP) and are only of use when there is plenty of contrast in the data. This means that the fishery is often overexploited by the time the trends to maximum sustainable yield become clear. Information and data about a fishery are collected to support the objectives and programmes of whoever is managing the fishery. The multi-species (Fig. 2) model predicts the behaviour of complex assemblies of fish when subject to fishing and environmental pressure. It shows a total yield that is sustained for a considerable range of effort giving a flat or plateau type yield curve. This sustained yield hides a series of changes to the fish community whereby successively smaller species replace the larger species. The model tends to be relative as it does not predict the level of sustained yield but does trace the health of the fish assembly as a series of measures (Table 1). Table 1 Criteria used in assessing the state of health of multi-species fisheries. Trends indicate a fall in the general health of the fish assemblage. Many of these measures are relatively simple and easy to obtain such as the mean length of the fish. Assessment of the state of complex fish stocks can probably be done on the basis of mean length alone. Other measures are more difficult to obtain such as the Production/biomass ratio (P/B) that measures the total biomass present and the rate of production by the fish community or species. One problem with this model is that both fishing and environmental factors influence the fishery in a similar manner. It is, therefore, important to be able to disentangle the relative contribution of the fishery and the environment. This generally requires better knowledge of environmental states than is often available. The following section examines examples of the decisions that have to be made regarding the fishery and the type of data required. National decision making on the fishery usually concerns an assessment of the value of the sector to the national economy, the allocation of funds to the sector or the amount of funds that can be obtained from it in the form of taxes and license fees. Table 2 indicates the type of information that is needed to answer the sorts of questions that are likely to be asked for economic planning of the inland fisheries sector. The classical approach to management of fish stocks is by centralized control of the fishery through mesh size restrictions, prohibitions on gear, closed seasons, harvest reserves and restrictions of access through licenses or catch quotas. Classical fisheries management requires very complete data on the fish, the effort and the selectivity and performance of the fishing gear used. Completeness of data of this order is needed for all major species in the fishery. All too often the data needed for such decisions was lacking and the national authorities in charge of the fishery assigned arbitrary values to such factors as mesh size. This led to a general disregard for regulations on the part of fishers and is a contributing factor to the poor state of inland fisheries today. More recent approaches tend to concentrate mainly on restriction of effort and co-management involving the participation of other stakeholders in the fishery in decision-making and management. The information needed for this approach is far simpler and qualitative, length-based data often suffice. Furthermore the audience for the information is different. In centrally controlled systems only the government planning authorities need the information. In more recent systems the information also needs to reach the stakeholders to assist them in local decision-making. In addition to the output and input controls traditionally applied to the fishery, fish stocks are increasingly manipulated by such processes as stocking or introduction of new species. Table 3 indicates the type of information that is needed to manage fish stocks. Fisheries management has moved away from an early preoccupation with the fish to a greater concern about the livelihoods of the fishers and their families. This increased social and economic dimension has given rise to the need for other categories of information than the simple fisheries statistics that formed the traditional basis for management. There is increasing concern with such issues as equitable distribution of the benefits from the fishery, reduction of conflict both within fishing communities and between the communities and other users and gender participation in the fishery. Table 4 illustrates some of the issues and the types of data needed for their resolution. There is increasing concern about the conservation of inland fish resources. In part, this is a response to the contractual obligations of the individual countries to the Convention on Biological Diversity, and any other conventions such as Ramsar to which they might be signatory. It is also a response to the perception that fish stocks are in decline everywhere and large species particularly are disappearing and may well become extinct. Conservation has built up a supplementary need for information, examples of which are given in Table 5. This paper suggests some principles for planning, collecting and interpreting data and information. First, data collection should only be pursued with a clear view as to what the data is to be used for. Fishery management policies and objectives should be defined and the models for management chosen. Reference points and variables need to be chosen to guide the policies and support the models. The data and information needed for the variables can then be selected. Second, in resource poor societies the data collected should be limited to that which can be collected with the resources available while conserving the quality of the data. Accuracy of data should be favoured over precision. Policies and models should not be overly complex and should be consistent with the data gathering capacity of the society. Third, data on their own are of little use and must be analysed to become information. The process of analysis is as important as that of data collection. Fourth, whatever the circumstance there should be a long-term commitment to collect at least the most basic catch statistics at representative landings. Many institutions in a modern state generate fisheries related information. Central or regional government agencies are usually charged with the collection and interpretation of basic fisheries data. Research on particular topics is usually the function of specialized research institutes and programmes in government or in universities. Externally funded projects may carry out particularly intensive one-off studies such as frame surveys. To this can be added the wealth of traditional knowledge held by the fishers and other stakeholders in the fishery. There is also usually a considerable amount of information already available in the world's libraries that can contribute to our knowledge. The problem you are facing is probably not new and has already been studied by others, so the answer may lie somewhere in the literature. Information is only of value when it is used. The information from all sources has to be interpreted and fed into the management plan. One problem that the fisheries sector has faced is the poor quality of its data as compared to other users of aquatic resources. A further problem lies in the exclusion of certain types of information gathering mechanisms from the management process such as universities or traditional knowledge of fishers. This means not only that fisheries management has been generally defective, but also that the sector has not been able to secure an adequate share of the water on which it depends. This situation needs to be rectified by the improved development of sampling and other information gathering activities as well as the development of mechanisms that bring together the information from the various national and international sectors.